I heart oatmeal raisin cookies. They’re sweet, chewy and oat-y enough to feel a bit healthy. 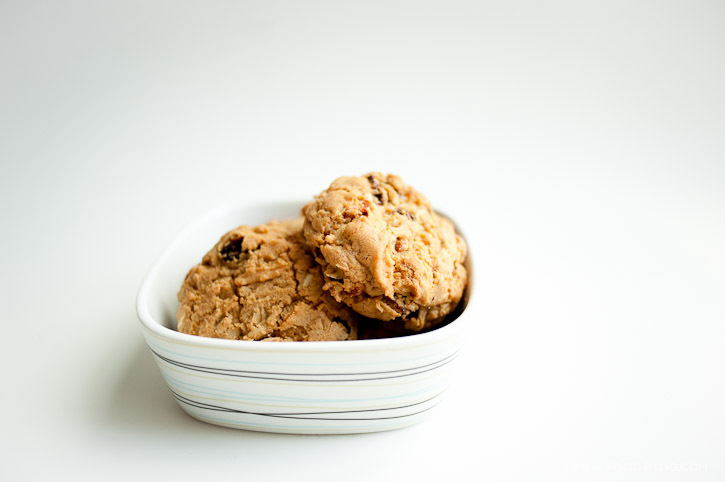 But, my love for oatmeal raisin cookies isn’t steadfast; I’m a picky oatmeal raisin cookie lover. 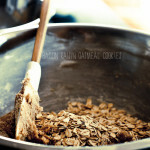 I strongly dislike crunchy oatmeal cookies. For me, it’s a soft oatmeal cookie or no cookie at all. My mom didn’t make oatmeal raisin cookies when I was a kid, so for the longest time I actually didn’t like oatmeal cookies at all. Back then my oatmeal cookies came out of a yellow bag from the grocery store. They were crunchy and hard and if you weren’t careful when chewing, they had the potential to cut up the roof of your mouth–it wasn’t a big surprise that they weren’t my favourite. 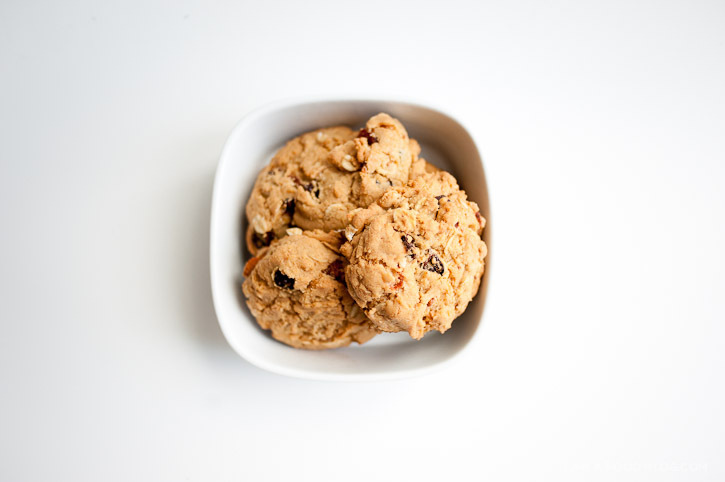 What was a big surprise was when I had my first fresh baked oatmeal raisin cookie in Whistler. I was there with my grandma and cousin (the one who loves Church’s Fried Chicken). My cousin and I had somehow gotten roped into going on a senior’s trip with my grandma that entailed yellow school buses full of old Chinese grandmas and grandpas. My cousin and I were the only people there under the age of 60. After a long and windy drive from Vancouver to Whistler everyone was unceremoniously dropped off at the edge of Whistler village and told to entertain ourselves for an hour or two. My cousin and I were ravenous. We ran ahead of my grandma and her friends on the lookout for food. We found a tiny bakery with the sweet scent of fresh baked cookies. 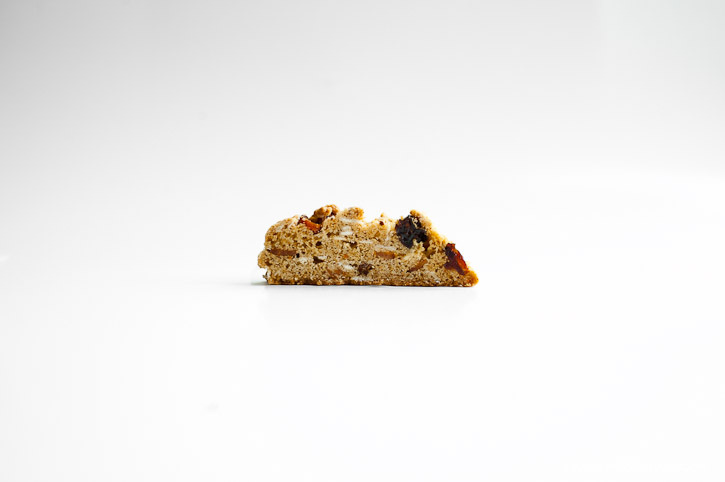 I chose a oatmeal raisin cookie (strangely) and I loved it! It was a completely different creature from the other oatmeal raisin cookies I had before. Soft and chewy with a hint of cinnamon…after that cookie I was ruined. I never touched another store bought cookie again–unless the store was a bakery. 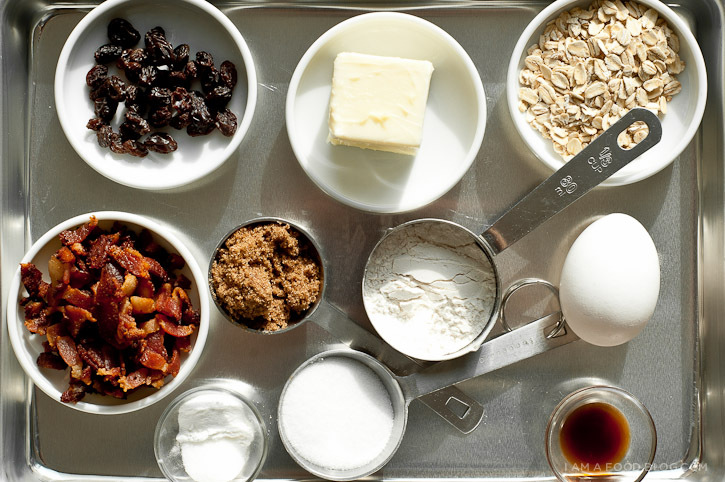 These oatmeal raisin cookies can come out a bit on the crispy side, so make sure you keep an eye on them while they’re baking. I’d pull them out on the slightly under baked side, just to ensure a soft and chewy bite. Bacon might sounds a little crazy in a cookie, but trust me it works. It’s that great combo of sweet and savoury. The best part is the bacon! 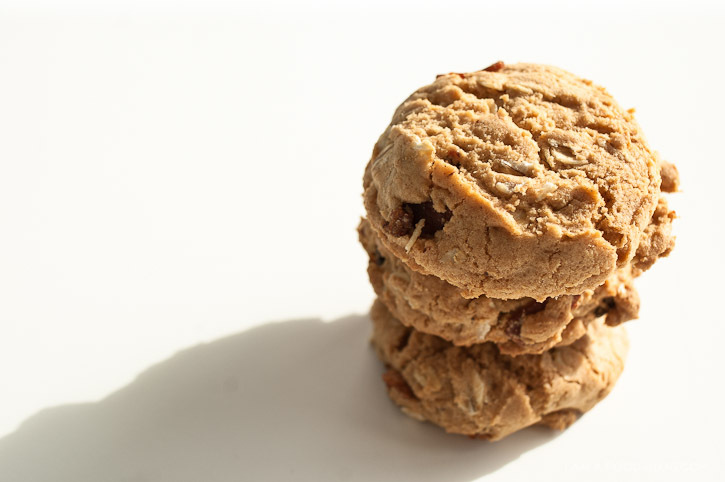 I am oat-filled, I am bacon-studded: I AM BACON OATMEAL RAISIN COOKIE! Line 2 baking sheets with parchment paper. Whisk flour, baking powder, salt and baking soda in a medium bowl. Beat both sugars and butter in a large bowl. Add egg and vanilla, mixing well. Mix in dry ingredients. 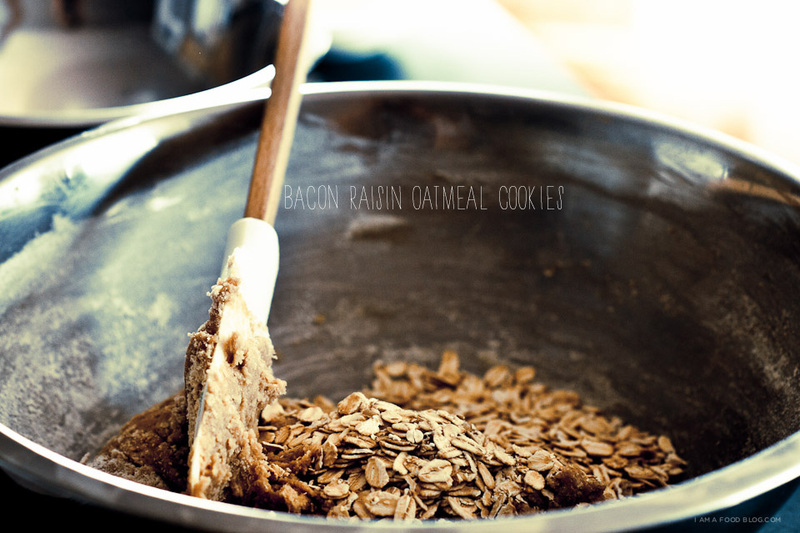 Fold bacon, oats, and raisins into batter and stir until evenly incorporated. Using a 2-oz. ice cream scoop or 1/4-cup measure and forming dough into balls, scoop batter onto prepared sheets, spaced at least 3 inches apart. Chill dough for 1 hour or cover and chill overnight. Arrange racks in upper and lower thirds of oven; preheat to 375°F. Bake cookies, rotating pans halfway through, until edges are light golden brown and centers are still slightly soft, 20–22 minutes. Let cool on baking sheets for 10 minutes. Transfer to a wire rack; let cool completely. do ahead: Can be made 3 days ahead. Store airtight at room temperature. Enjoy! What would you suggest if I wanted to make this recipe as muffins? Just tried this sans gluten and swapped out the raisins for crasins. This was such a great tasty treat and perfect for breakfast on the go! Thanks for sharing this great recipe.